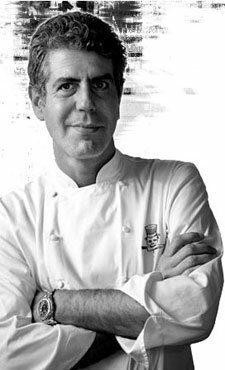 Born in 1956, Anthony Bourdain attended Vassar College and graduated from the world-renowned Culinary Institute of America. He began running New York kitchens at restaurants such as Supper Club, One Fifth Avenue, and Sullivan’s. His extensive body of work has graced the pages of The Times, New York Times, Observer, the Face, and Scotland on Sunday. He is an ongoing contributor and authority for Food Arts magazine. Tony currently lives in Manhattan and works as executive chef of Brasserie Les Halles. Bourdain’s fictional works include two crime novels – 1997′s Gone Bamboo and Bone in the Throat in 1995. Two years later, The New Yorker published Tony’s scathing exposé of NYC restaurants Don’t Eat Before Reading This to incredible review. The article’s success both in the U.S. and overseas would serve as the catalyst and basis for Bourdain’s hugely successful Kitchen Confidential: Adventures in the Culinary Underbelly . In 2002, the Food Network debuted what would become a twenty-two episode series featuring Bourdain circling the globe and feeding his adventure eating habit with the most extreme cuisine the world had to offer. The inspired bestselling book, A Cook’s Tour In Search of the Perfect Meal , met with huge success in the United Kingdom and the United States. Two years later in October of 2004, Bourdain released the Anthony Bourdain’s Les Halles Cookbook: Strategies, Recipes, and Techniques of Classic Bistro Cooking . With over one hundred recipes, Tony provides the secrets to some of his best recipes in typical bawdy fashion. Bite Magazine; Ian Rankin in the Guardian; A Cook’s Tour with Food Network Canada, USAtoday.com, ABC, Slate, Powells.com, and LongIslandPress.com.